Hand carved and hand printed in CA. Linocut prints are accessible works of art. The beauty of a linocut print is each print is completely unique, so no two pieces will ever be exactly the same. Original artwork is not something that is always accessible to the average working class home. Linocut prints allow every home to have a professional original artwork that captures craft and design. Two color prints add depth to any art collection no matter how big or small. Creating linocuts allows me to work with my hands and also think 2-dimensionally. Something that my day job doesn't always allow me to do. I love working with many mediums, and hopefully can share some of those creations with you too. Cheers! Hand carved and hand-printed 5"x7" linocut print of a California road sign with CA poppy and snowcapped mountains to remember an unforgettable California road trip. Printed artwork is 3" x 4", card stock printed on is 5" x 7". Paper Source card stock in white with safe wash relief ink. Excellent for framing and makes a great gift for a housewarming, thank you or birthday. Comes signed by the artist, packaged in a clear plastic sleeve and mailed in a protective envelope. **Slight variations are possible as I print each one individually by hand. Frame, mat, and props (in photo) are NOT included. Hand carved and hand-printed 5"x7" linocut print of a desert landscape on a bright moonlit night in springtime. Printed artwork is 4" x 6", card stock printed on is 5" x 7". Paper Source card stock in white with safe wash relief ink. Excellent for framing and makes a great gift for a housewarming, thank you or birthday. Comes signed by the artist, packaged in a protective sleeve and mailed in a protective envelope. Hand carved and hand-printed 5x7" linocut print of an oak leaf with a radiating border. Printed artwork is 4" x 6", card stock printed on is 5" x 7". Paper Source card stock in white with safe wash relief ink. Excellent for framing and makes a great gift for a housewarming, thank you or Mother's Day gift. Comes signed by the artist, packaged in a clear plastic sleeve and mailed in a protective envelope. 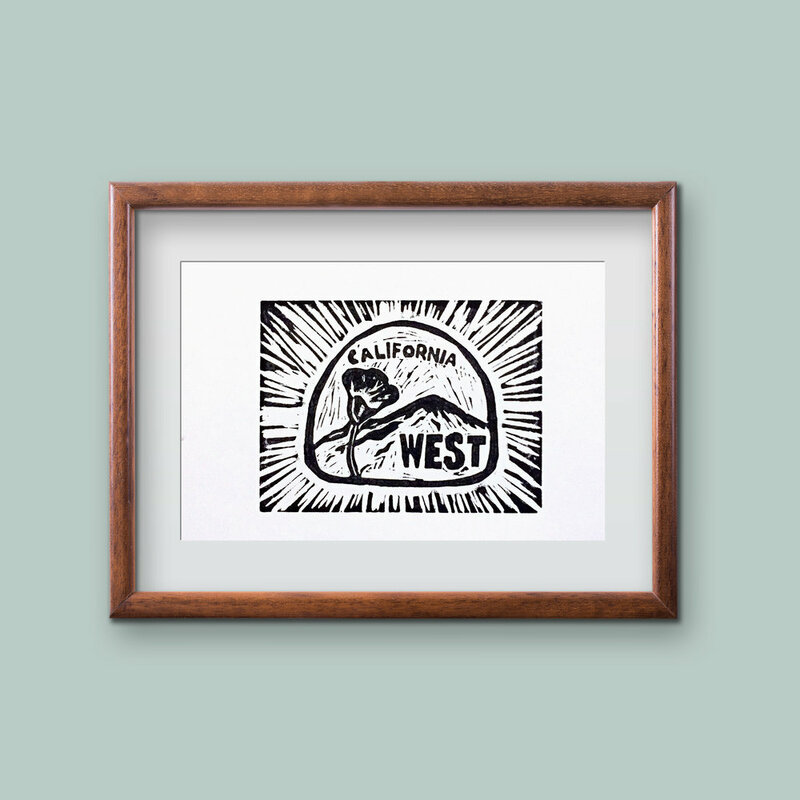 Printed artwork is and adaptation from Calle Bonita Studios original hand carved linocut print of a California road sign with CA poppy and snowcapped mountains to remember an unforgettable California road trip. Printed artwork is and adaptation from Calle Bonita Studios original hand carved linocut print of O's Whale. Comfy every day t-shirt for the California girl. Chicken or the egg wrapping paper is sure to be a hit at every baby shower. This cute pattern is gender neutral with a pale yellow background; perfect for every baby shower gift! Printed artwork is and adaptation from Calle Bonita Studios original hand carved linocut print of Oak Leaf Energy. Running shoes, stop watches, and dumbbells fill each sheet making their gift truly unique. Hand carved and hand-printed 5x7" linocut print of a pineapple, the international sign of 'welcome'.